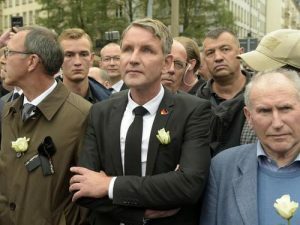 Germany’s right-wing Alternative for Germany (AfD) party has surged in popularity to become the country’s second most popular party behind Merkel’s Bloc. 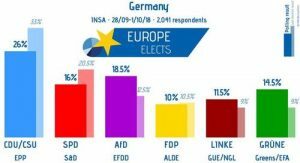 While one recent poll commissioned by Germany’s Bild am Sonntag newspaper has the party at 18% support, a Monday INSA Poll has the party at 18.5% – an all-time high. Coming in third is the Social Democratic Party of Germany (SPD) at 16% popularity. AfD’s popularity is the latest sign that the populist wave sweeping Europe continues to pick up steam, as Europeans steadily reject open-border globalism and other progressive policies. Critics on the left suggest that the party is simply catering to public fears and frustrations over migrants. Liberals are scratching their heads over the rise of AfD – suggesting that it’s a product of insecurity. So, how has the AfD managed to garner so much support for its “alternative” for the country? Over 1 million asylum-seekers came to Europe beginning in 2015, mostly from Syria, Afghanistan and Iraq, after Angela Merkel opened the country’s borders. German conservatives have have levied heavy criticism over the policy, and locals have grown frustrated at spiking crime rates blamed on migrants. And while Europe’s establishment parties are still in control, winning elections – they have given up a lot of ground as populist parties make considerable gains. ER Editor: Certainly the Left has had an international network for over 100 years. See Ioan Ratiu’s excellent book, The Milner Fabian Conspiracy. Liberal German also blame social media for the rise in right wing populism – particularly Facebook. In other words, the left can’t meme.